Starting in October 2005, all NEW child support recipients will be receiving their payments electronically through a project the Ohio Department of Job and Family Services (ODJFS) called e-Disbursement. Individuals who currently have a child support order in Trumbull County can enroll in this program voluntarily at any time but the program will eventually become mandatory for all individuals receiving child support. 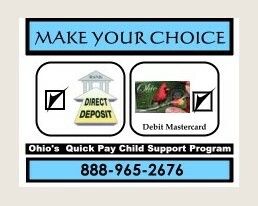 You may choose between Direct Deposit or through a debit card called the Ohio e-QuickPay Debit MasterCard. If a child support recipient chooses Direct Deposit, support payments will be deposited directly into a checking or savings account at the individual's bank or financial institution. This will provide additional security since there will not be a chance for lost or stolen checks. It will mean recipients will receive payments faster because they will not have to wait for checks in the mail. The Ohio e-QuickPay Debit MasterCard is not a credit card. It works like a debit card. Processed payments will be posted onto the card. Cardholders can use the e-QuickPay Debit card at any ATM, bank, or merchant displaying the MasterCard logo. The card can also be used to get "cash back" with a purchase from many locations. As with a debit card, if you use the card to purchase groceries, you can also get cash back at the same time. Any purchases, including cash back, or cash withdrawals from an ATM or bank will be deducted from the balance on the card. This will save trips to the bank or ATM. Families wanting to enroll can contact 888-965-2676 for more information.